I'm back. I know it's been a while since I have posted anything. Yes, I am still around just not doing a lot of blogging. My schedule has truly been crazy busy. 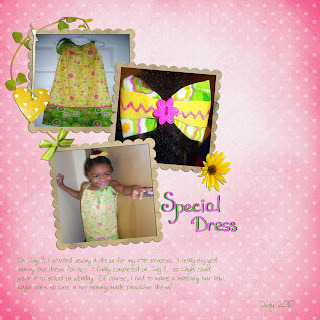 I miss posting on my blog. . Well I made my first dress for my little princess. She was so excited about mommy making a dress for her. She wore her mommy made dress to school with a big happy smile. The dress was very easy to make. I plan to sew a little more. I actually used another pillowcase dress Kayla had as a pattern to make this one. If you would like to make this dress you can find a pattern at http://www.youcanmakethis.com/index.htm .